The ChargeBox was developed by OverBoard Industries to make fishing with glow lures easier and more effective. What is the The ChargeBox? 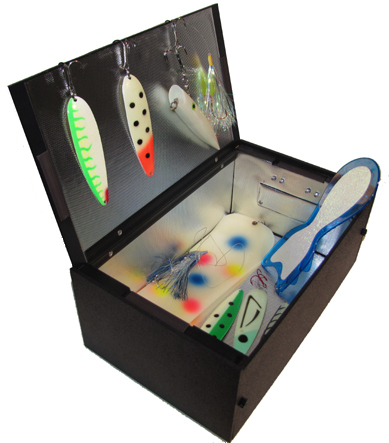 Simply put, the The ChargeBox is a collapsible box with a reflective lining that uses UV lights (powered by batteries) to charge your glow lures. The goal was to create a device that would be lightweight, portable, and easy to use. Simply put your lures in the ChargeBox, turn it on, wait a few minutes (for example while you're on your way out to your favorite fishing grounds) and your gear is charged up and ready to go. Where is it made and what is it made of? We are proud to say that the ChargeBox is made in the USA. We specifically chose NOT to send any of our manufacturing overseas or buy materials from overseas. We use American technology and efficiency to produce great quality products at great prices. It's very important to us to support our country and local economy. Let's face it, we've taken enough hits here (especially where we are located – Detroit, Michigan) so if we as a company can give our business to the local guys, we will. Rest assured that when you buy a ChargeBox, your money is staying here and helping out companies that have been affected by the economic issues that have faced us all. We are also proud to say that we use recycled plastic in our product. As far as we're concerned, we'd rather recycle plastic back into our products than risk it ending up in the lakes we fish. We all treasure the outdoors and want to make sure it stays as clean as possible for us and our children to enjoy. We are fishermen just like you. We spend as much time as possible in Lake Michigan chasing salmon, steelhead, and browns throughout the year. Basically, we had an idea that we wanted to share with all of you. After fishing for salmon for 25 years using flashlights, camera flashes, etc to charge glow lures, we knew there had to be a better way to charge those lures. So we invented the ChargeBox. It's helped us out, and we know it can help you out too. We formed our company to bring the ChargeBox to you, and come up with other ideas to make fishing more enjoyable and in the end – of course more productive! What can I use in the ChargeBox? Anything you want! You can put spoons, plugs, body baits, flies, and even paddles in the ChargeBox. We created the ChargeBox to be big enough so that you could put two large size paddles side by side in the device (see our photos section for an example of that). Why use a ChargeBox and not a flashlight or camera flash? There are several reasons you would want to use the ChargeBox versus a camera flash or flashlight. First off, the UV light in the ChargeBox charges the lures much more deeply – and for glow lures this is very important. As a result of the deeper charge lures glow much brighter, and also glow for much longer than those charged with other devices. Another reason to use the ChargeBox is that you can place several lures in it at once, charging up your whole program at the same time. Finally, it's a whole lot more convenient to put everything in the ChargeBox and just turn it on, so you can concentrate on other more important things, such as figuring out where the fish are!